Bird of Paradise (Strelitzi a riginae) is loved for its showy orange or white flowers that resemble those of an exotic bird. Hardy to USDA Hardiness Zone 9, it is an evergreen with large leaves (18 inches long) that don't drop, making it a tidy choice for use around pools. 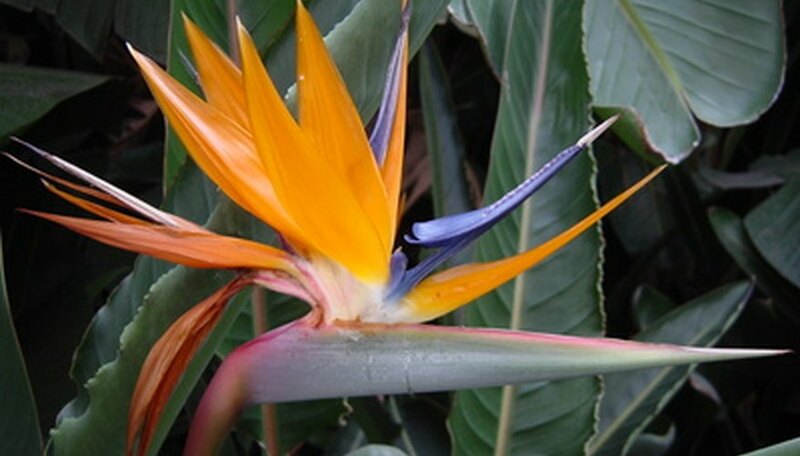 The plant grows to between 3 to 5 feet tall, although the Bird of Paradise tree (S. Nicolai) grows to 18 or 20 feet. These plants have a massive, heavy root system and can cause damage to foundations and water pipes. Plant them well away from the house in full sun to partial shade. Any roots left in the ground will re-sprout, so it's important to kill or remove all of them. Remove the foliage so you can reach the root. Cut through the stems with a pruning saw 6 inches above ground. Cut through branches larger than 3 inches in diameter with a chain saw (likely if you have a bird of paradise tree). Dig a trench with your spade around the base of the plant, 18 inches from the trunk. Dig to a depth of 12 inches and remove all the soil from the roots. Cut the crown, which may be 3 feet wide, in smaller pieces with an axe. Remove the pieces and discard them in the trash. Depending on how small you cut the pieces, you may need a partner to help you lift them. Dig out as much of the root system as you can with your spade. Paint the remaining roots with a brush killing product that contains triclopyr. If new growth emerges, cut the tips as soon as you notice them and brush with more product. You may need to repeat this procedure for several months until any remaining root system is dead. Brush-B-Gone is one brand name product containing triclopyr. Use gloves and follow directions carefully when applying it. Triclopyr will kill surrounding plants, as well, so apply it carefully only to freshly cut Bird of Paradise roots.